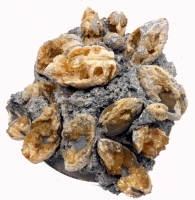 This very rare and beautiful specimen of unique Amber calcite crystals growing inside a fossil Mercenaria permagana clam was found in Rucks Pit at Fort Drum, Okeechobee County, Florida. 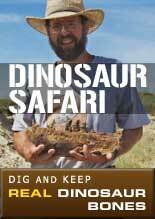 It is 1.6-2 million years old. Note the orientation of the clams, most are in "life position". Whatever ecological disaster caused the entrapment of these clams must have been sudden and overwhelming. 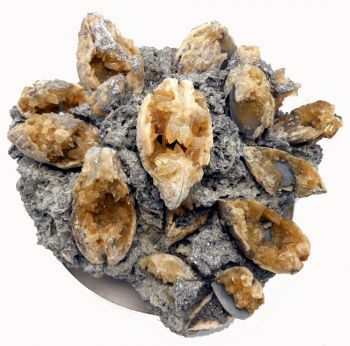 Later dissolution of portions of the clam shells and surrounding limestone by fresh ground water caused super-saturation with respect to calcite, and crystals grew where available large voids occurred (i.e., inside the clams). The yellow color of the calcite is likely due to traces of iron, which is present in large amounts in area surficial aquifer system waters. The calcite is somewhat fluorescent and phosphorescent displaying yellow-green under both short and long wave ultraviolet light. The geological age of this specimen is 1-2 million years old (Pliocene-Pleistocene). During this time, the Kissimmee River valley was a shallow, V-shaped salt water bay, narrow at the northern end near present-day Orlando and widening to the south in the vicinity of Lake Okeechobee. Rucks Pit is located near the eastern paleo-shoreline of this inland bay. In addition to Mercenaria, other shallow marine fossils are found within the same stratigraphic horizon. 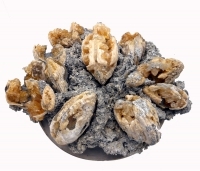 Less commonly, calcified whelks, ark shells, oysters and other bivalves turn up, as do calcite-encrusted mangrove roots and seeds. The matrix is a very highly permeable calcite-cemented mixture of quartz sand, shell fragments and dark organic matter (the latter presumably mobilized from later, overlying organic-rich sediments or soils). When collected in situ, most of the rock matrix void spaces are filled with a mixture of quartz sand, shell fragments and clay, while the Mercenaria clam interiors are largely devoid of sediments, and are instead filled with fresh ground water. The original Rucks Pit is now closed, and has been allowed to flood, creating an artificial lake thus no additional specimens will be forthcoming from the original site. Individual 4-5 inch clams with crystals sell for $350 each. Large specimens like this one with many clams and crystals are very rare and hard to recover. This specimen has a variety of sizes of clams, 15 in all. It is 12-15 inches in diameter, 6 inches high and weighs 12 pounds. A larger specimen found in 2005 that is 35 x 25 x 6.9 inches with 40 clams has an asking price of $24,000. Our specimen is available at only 1/10 that price at $1,920.